Chef's Coast to Coast is highlighting a past favorite interview on this week's episode. The "Chef's Special," typically a dish that uses the season's best ingredients, is our version of bringing to light the stories of chefs that really spoke to us. This week’s episode features Chef Joey Celmer who has more than 15 years experience in the culinary industry. Upon graduating from Le Cordon Bleu Culinary Institute with honors, Celmer worked throughout the greater Chicago area in healthcare and as a private chef learning the importance of nutrition, organization, meticulous service and dietary needs. 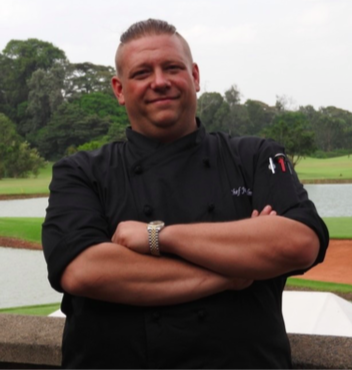 His extensive background has lead him to work with leading chefs in France, Italy, Greece, Brussels and Kenya. He has been honored to serve government officials, embassy leaders, professional athletes and royalty. In a large bowl, combine vinegar, Dijon. Gradually whisk while drizzling in olive oil. Whisk until the vinaigrette is emulsified. Season with salt and pepper. To the bowl add sweet corn and tomatoes. Gently mix until all ingredients are covered. Add the avocado dices and basil and fold gently. Set aside. Cut 12 to 14 slices of ciabatta bread into ½ thick slices. Brush each side lightly with olive oil and grill on both sides until toasted. 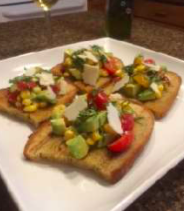 Top each slice of the toasted bread with the tomato, corn and avocado mixture. Either serve whole or cut in half. An optional garnish is shaved parmesan.